I may say I have some experience when it comes to dealing with beauty products. Like most people, I have my share of acne problems/black heads and so on. I'll try to share my experience here with you. I think a lot of those reading this today know what I'm talking about. Acne is just annoying isn't it. No matter what you do you just can't get rid of it forever. BUT you can definitely make it less. Yes, that's right. Here are some products to help you out. You need a good sunblock. I know it makes your skin oily and shinny but it really helps. I should get back to putting it on! I think they have a new cover, I still have the old one because I saw the new one in my sister's products. The new one is all orange, not like this one. You also need a good scrub, it just makes your skin soft and helps removing acne. I prefer using neutogina. 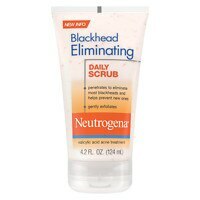 They have a great blackheads scrub that helps your acne and blackheads. Make sure you use it daily or at least 3 times a week. The Neutrogena scrub I just mentioned rocks, besides their mask. It's for your T-zone. T-zone nose strips are awesome because you can see immediate difference. I gotta get a new one soon. While using different products for my face I noticed that my skin often becomes dry, and I need to keep on moisturising it. Nivea's day care moisturiser is just unbelievable. My lips often get dry too, and the best lip palm is labello. I've been using it since forever. I'll definitely look for these when I go to the supermarket. Problem is that not as many things come here as they do to Oman. Like.. I don't have Clare's :(. Anyways, thank u 4 the tips! Or is it Claire's? Can't remember, it's been a long time since I went to the US :).